1. Point-to-point: Network between a pair of routers. 2. Broadcast multiaccess: If you connect the routers to a switch, the switch is broadcast capable. OSPF over EoMPLS behaves the same as broadcast multiaccess, OSPF routers do not know the existence of EoMPLS at all. DR is required, BDR can be elected if chosen. 3. Non-broadcast multiaccess: A network that connects more than two routers but without broadcast capability such as frame relay, ATM, X.25. DR is required, BDR can be elected if chosen. This lab will explore the behaviour of OSPF in NBMA network using Cisco mode and RFC compliant mode. In this NBMA network there’s no need to configure ospf, this lab is to show OSPF behaviour for different network types. Ignore the discontiguous area 3 which I have configured for OSPF via FR. If area 3 is needed to connect to Area 0 a GRE tunnel can be established to extend area 3 to area 0. Cisco’s recommendation is not to have more than 50 routers per area, and not more than 3 interfaces on every area for one OSPF router. I reckon that GRE tunnel is considered an interface. OSPF adjacency has to be manually configured. Non-broadcast is the default type for multipoint FR in accordance to RFC. DR and BDR must be elected. Typically for full mesh or partial mesh topology. Hello packet sent by OSPF router in non-broadcast network is every 30 seconds. Here’s the debug output for 2651-3 when adjacency was established using neighbor command. The full adjacency took 2mins in non-broadcast. 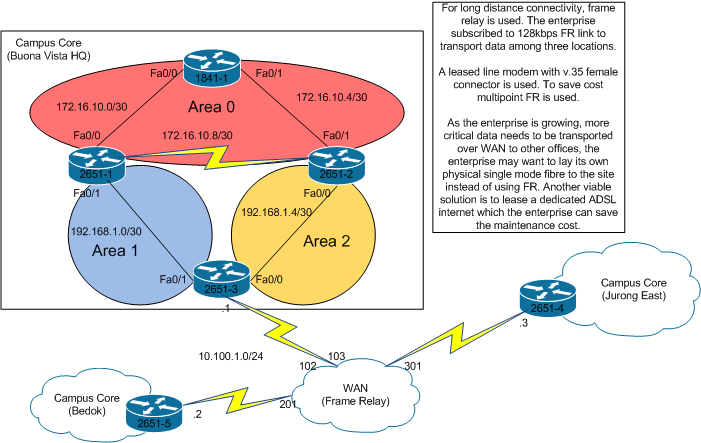 This entry was posted in Frame-relay, OSPF, Route, WAN and tagged frame_relay, nbma, ospf. Bookmark the permalink.